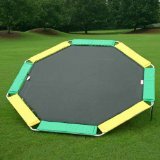 Magic Circle Trampolines - Trampoline for Me! As for jumping height… I could do double flips on this with no problem at all. My friend who owns this weighs 250 pounds and he’s doing the same. This really is insane. It comes with really high-quality springs, the same quality that are in olympic trampolines. They are of course rust resistant, as is the frame. The frame is really thick – as thick as a nickel – so no twisting, no breaking, just jumping. Just bear in mind that this comes without safety enclosure so please be extra careful when jumping on it. My friend didn’t buy it at all and he had no problems whatsoever. Kids usually tend to jump against the enclosure if you have it. There is a version with enclosure, but it costs around $500 more and I don’t know whether it is worth that much. Just be careful. I really enjoyed my time on this one. 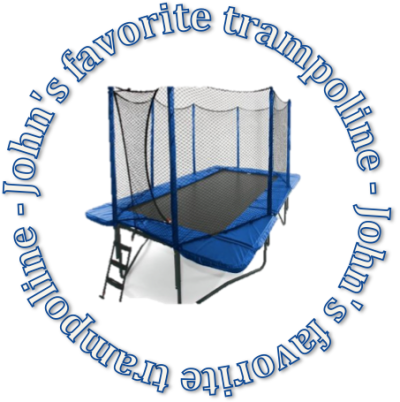 It truly is a great trampoline and all of my recommendations go out to this if you’ve settled on the octagonal type.